Caroline Lucretia Herschel (16 March 1750 - 9 January 1848) was a German-born English astronomer. She worked with her brother Sir William Herschel. Her main contribution to astronomy was the discovery of some new comets. In particular, the periodic comet 35P/Herschel-Rigollet bears her name. M. Wolf discovered asteroid #401 Ottilia. Robert Goddard launched the world's first liquid-fuel rocket, which flew 184 feet (56 meters) in 2.5 seconds, at Auburn, Massachusetts. This event is considered the "Kitty Hawk" of rocketry. Vladimir Mikhailovich Komarov (16 March 1927 - 24 April 1967) was a Soviet cosmonaut who became the first human to die during a space mission, after having commanded the first mission with a crew of more than one, and as the first person to fly to space twice. Born in Moscow, Komarov showed an early interest in aviation. At the age of fifteen, he entered the "1st Moscow Special Air Force School" where he graduated with honors in 1945. After attending two Air Force colleges, he entered the Soviet Air Force as a lieutenant. He received further promotions, and became a test pilot at the Central Scientific Research Institute at Chkalovsky. Komarov was one of twenty cosmonaut candidates selected for "Air Force Group One" in 1960. In spite of medical conditions that had him in and out of training, including a heart condition similar to the one that grounded Deke Slayton, he continued his path into space. Komarov was named as the prime crew commander for Voskhod 1 by the State Commission on 4 October 1964, just eight days before its scheduled launch. The flight of three cosmonauts, launched 12 October 1964 at 07:30:01 UTC, lasted 24 hours 17 minutes, and was the first space flight with a crew of more than one. Its success earned Komarov the awards of the Order of Lenin and Hero of the Soviet Union. Assigned to the Soviet Soyuz program, Komarov and his fellow cosmonauts became increasingly anxious about the lack of response to their concerns over the design and manufacture of spacecraft. Komarov was selected in 1967 to command Soyuz 1, with Yuri Gagarin as his backup. Although they knew the spacecraft had major safety problems, Komarov chose to fly because if he refused, Gagarin would be forced to go instead. He insisted before the flight that his funeral be open-casket so that the Soviet leadership could see what they had done. Launched 23 April 1967 at 00:35:00 UTC, Soyuz 1 immediately started having problems. One of the solar panels failed to deploy, leaving the spacecraft short of power and obscuring some of the navigation equipment. Radio systems failed, so telemetry coverage and contact with the capsule was incomplete. Komarov experienced difficulty orienting the ship as well due to thruster failures. Because of the problems, the launch of Soyuz 2, which was supposed to rendezvous for an EVA crew transfer, was cancelled. (The official reason for the launch cancellation was "heavy rains at the launch site.") In spite of the problems, Komarov was able to successfully re-orient the craft for its deorbit burn after the mission was cut short. However, the main parachute failed to deploy due to a pressure sensor failure and the manually deployed reserve chute became tangled with the drag chute. As a result, the reentry module hit the ground in Orenburg Oblast at about 40 m/s (140 km/h; 89 mph), and Komarov died on impact. Komarov received several honors posthumously, including a second Order of Lenin and Hero of the Soviet Union, being named in two memorials left on the Moon by Apollo astronauts, and having a Lunar crater and an asteroid named in his honor. A. Schwassmann discovered asteroid #1303 Luthera. C. W. Tombaugh discovered asteroid #3754. L. Boyer discovered asteroids #1380 Volodia and #1392 Pierre. The Convair CV-240 made its maiden flight, the first twin-engine pressurized airliner. The first launch of a Titan 2 rocket was performed, the booster later used for launching NASA's Gemini spacecraft. USSR launched the first satellite given a Cosmos designation. Cosmos 1 (aka Sputnik 11) employed radio methods to study the structure of the ionosphere. NASA launched Gemini 8 carrying Neil Armstrong and David Scott for the first manual docking in space. Gemini 8, launched 16 March 1966, was the sixth crewed Earth orbiting spacecraft of the Gemini series, manned by astronauts Neil Armstrong and David Scott. The primary mission objectives were to perform rendezvous and four docking tests with an Agena target vehicle, and to execute an ExtraVehicular Activity (EVA) experiment. Other objectives included parking the Agena in a 410 km circular orbit, performing a rerendezvous with the Agena, conducting systems evaluations, evaluating the auxiliary tape memory unit, and demonstration of controlled reentry. Ten technological, medical, and scientific experiments were carried on board. During the first six hours after launch, the spacecraft performed 9 maneuvers to rendezvous with the Gemini Agena Target Vehicle (GATV), launched earlier the same day. The rendezvous phase ended at 4:39 p.m. EST, with the spacecraft 45 meters apart with zero relative motion. Stationkeeping and other maneuvers were performed for about half an hour, and then Gemini 8 moved in and docked with the GATV on the 5th revolution at 5:14 p.m. EST, the first docking ever to take place in space. About 27 minutes after docking, at 5:41 p.m. EST, the combined vehicle began to go into a violent yaw and tumble. Armstrong disengaged the Gemini capsule from the GATV causing it to roll, pitch, and yaw even more rapidly than when it was connected to the GATV, approaching a rate of one revolution per minute. The astronauts fought to control the spacecraft for three minutes. Armstrong managed to deactivate the Orbit Atitude and Maneuver System (OAMS), and in a final attempt to counteract the violent tumbling all 16 reentry control system (RCS) thrusters were utilized to damp out the roll. This manuever succeeded in stabilizing the spacecraft at 6:06:30 p.m. EST, but ended up using 75% of the RCS fuel. It was then discovered that one of the 25-pound OAMS roll thrusters (thruster no. 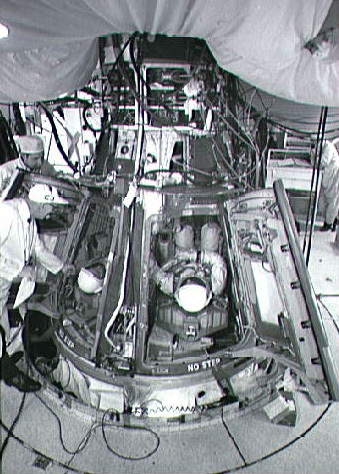 8) on Gemini 8 had been firing continuously, causing the tumbling. Apparently it had short-circuited while being used to maneuver the Gemini-GATV combination and had stuck open. Due to the premature use of the reentry control system, an immediate landing was required by Gemini safety rules, so the planned EVA and other activities were cancelled. Retrofire took place on the 7th revolution at 9:45:49 p.m. EST, just over 10 hours after launch, and the spacecraft splashed down in the western Pacific Ocean about 800 km west of Okinawa at 25.22 N, 136.00 E, 2 km from the target. T. Gehrels discovered asteroid #2272. NASA's Mariner 10 passed Mercury at a range of 203 miles (327 km), its closest approach, on the third encounter with the planet. USSR Soyuz 27 returned to Earth with cosmonauts Yuri Romanenko and Georgi Grechko aboard who had launched to the Salyut 6 space station on Soyuz 26. C. I. Lagerkvist discovered asteroids #2902 Westerlund and #3634; and L. Brozek discovered asteroid #3386. E. Barr discovered asteroid #3445. The predicted closest approach to Earth of Near-Earth object 1950 DA will occur, which might impact Earth. If a collision with the 1.1 km diameter asteroid occurs, it would cause an extinction event, destroying most life on the planet.